Dubai: “Where is Kindness?,” was the name of a radio series in New Zealand when Naresh Kumar went on an anti-trafficking expedition covering the length of the picturesque country on a tandem (two-seater) bicycle named Kindness in 2017. Picking up 140 strangers, including schoolchildren, to ride pillion on what he calls the “Freedom Seat”, Kumar raised over $55,000 (Dh202,015) by the time he finished the 3,330-km journey to raise awareness about child trafficking. “The response I got back then was amazing. I wasn’t raising money for New Zealand, I did it for victims in Thailand, Nepal, India and Cambodia. But it showed me how kindhearted they [Kiwis] are,” said Kumar, 36, whose heart broke when he heard about the last Friday’s terrorist attack in Christchurch, which claimed 50 lives. In the UAE last week on another tandem bicycle with the same name (Kindness), and custom-made by an expert with Jeffson Bikes in New Zealand, Kumar started from Chennai on February 27 and is pedalling to Germany to raise awareness and help victims of human trafficking and bonded labour. 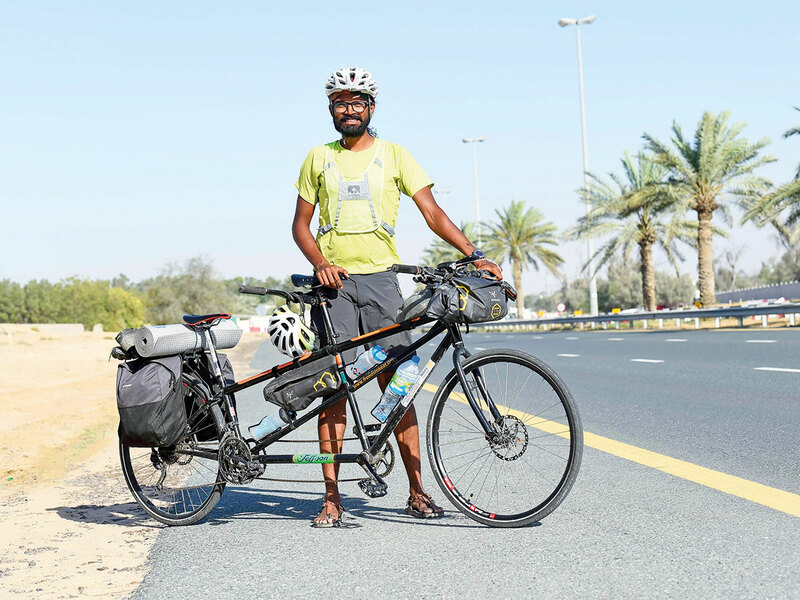 Pedalling from Chennai to Mumbai, he took a flight to Muscat and reached the UAE on the tandem cycle via Hatta. The Freedom Seat is still welcoming residents wherever he goes to take a ride with him, learn about his journey and join his mission. Headed to Bandar Abbas in Iran by ferry from Dubai on Thursday night, he plans to pass through Turkey, Greece, Slovakia, Bulgaria and Austria before reaching Hamburg in Germany, where he will attend the International Convention of the Rotary Club in June, the Chennai division of which is supporting his mission. Kumar said he would have covered nearly 9,000-km by the end of his expedition. Kumar said he gave up his job as a software professional in the US after he had a life-changing experience when he was solicited for sexual services with a pre-teen in Nepal. That was a life-changing moment for him. The aim of his globetrotting mission now is to end modern slavery and human trafficking across the world. I am doing it out of my choice. Girls in the captivity of traffickers don’t have a choice. That thought gives me all the encouragement when the going gets tough. Riding tandem is a fun way to get the involvement of the community in such missions, he said. Apart from the cycle weighing nearly 28-kg, Kumar carries a tent, sleeping bag, rubber mat, four cycle tubes, four pairs of clothes, a winter jacket, toothbrush and glasses when he travels. So far, he has faced four tyre punctures and damage to his derailleur on one occasion in this mission. The rain and strong winds in Dubai earlier this week also posed its share of challenges for Kumar when he rode along the deserts and on the highways. Kumar has been working with various NGOs and associations for rescue and rehabilitation of trafficked victims and for preventing bonded slavery.